When I first heard about the Eat from the Pantry/Freezer Challenge being hosted by Crystal and Jessica, I knew I had to join in! I had planned to eat lots of meals from my “stock the freezer” list during December…but that just didn’t happen! We were blessed with many meals from our church family and friends…and we blessed over the holidays to eat out or eat with family for most meals. So the freezer remains stuffed to the gills. Even my BIL noticed…as he couldn’t find space in either freezer for my SIL’s favorite Peanut Butter Chip ice cream (that can’t be found where they live)! Must. Clear. Out. The Freezer! 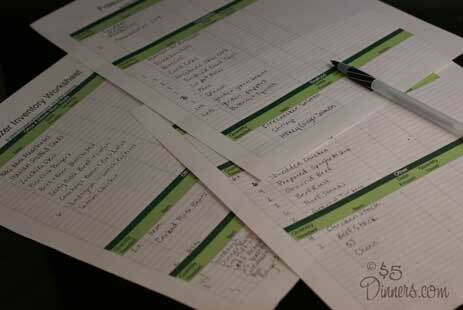 I printed off a copy of Once A Month Mom’s Freezer Inventory Worksheet…and I filled it out! So that is my challenge to myself this month. I plan to get back to posting my shopping trips…will share successes and (hopefully not) failures! Also, Tyler and I will be doing some traveling this month for cookbook signing and media appearances…so I’m not exactly sure how “the plan” will play out…but we’re gonna try! So here’s the plan…starting Monday! 22 – Beef Roast…still looking for a recipe to try! 27 – Pinto Beans…still looking for a recipe to try! The Eat out of the Pantry/Freezer Challenge…and the plan to make it happen! Happy New Year! And Happy New Decade, too!!! Looks great!! I got our inside freezer done yesterday. I still have to inventory the chest freezer and the cabinets! I wish you luck! We almost completely emptied our pantry last month.I have faith in you and your pantry and I bet you can do it! I have a couple of good recipes for you for your beef roast and your pinto beans. Here are the links! How much will this serve. I have a family of 5, one big teen age boy that eats the house. All left over usually go for lunch. Since my two younger ones go to private school and have to take lunch. And my oldest daughter hates to go out to eat. I was wondering how much one of the meals above serve? Thanks this was a great read. I will post on my blog how it goes. I am excited to try this. I will try for the $5. My challenge will be freezing. I need to learn a lot about this. Thanks for the link to the freezer spreadsheet! Mix all ingredients except roast meat. Pour mixture over roast meat in a roasting pan. Cook about 1-1.5 hours or until done (meat will shred apart). Oh! By the way…we’re having your Ham & Cheese Frittata recipe from last week this morning with our Christmas ham leftovers! It’s FABULOUS! Thanks for that recipe, too! On one of my Menu Plan Monday posts I talked about how I make roast in my crock pot, but basically I take a larger one for my family of 6 (with 3 teenagers), so it’s closer to 5 or 6 lbs, brown it in olive oil in a large pot, then place it in the crock pot. I press some salt and pepper into it with a spoon and pour 4 cups of beef broth over it. When it’s about an hour before we want to eat, I put in some cut up potatoes and a bag of baby carrots. For a smaller family you would want about a 3 lb roast and 2 cups of beef broth, and then fewer vegetables. When I make pinto beans, I use a bag of dry beans, pick out the icky stuff, rinse them a few times, soak them overnight (you’ll need to have extra water because they’ll soak some up), pour out that water, and then put them in the crock pot in fresh water just to cover them. If I need to add a little more during the day if they soak up more. I usually add either some leftover ham pieces if I’ve made it, or I’ll buy an inexpensive package of hamhocks in the meat department to put in for flavoring. You don’t want to ever add too much water so they aren’t runny; just keep them covered and then they’ll be thick. But if it gets runny you could always add some water and flour or cornstarch to thicken. Serve it with Jiffy cornbread. My pantry and freezer are bulging too, so today I’m sitting here with a list of food and brainstorming how to use it all up. Needs to be done every few months, I find! Wow! Thank you for sharing… this is so helpful! I just had to write you and tell you how wonderful your book is….i ordered it as soon as you said it was available from Amazon and then i just had to sit and wait…..i have become inspired just looking at all the wonderful recipes and having the prices next to the ingredients is oh so helpful…. I look forward to trying many if not ALL of the recipes. I’m not sure if this is quite what you’re looking for re: beef roasts but I have a no fail crock pot roast recipe. The secret is to add a can of the roasted garlic diced tomatoes. I usually add pearl onions, baby carrots, new potatoes or diced potatoes, a splash of worchester and red wine and a bay leaf or two and I sear the roast before adding but it’s the roasted garlic in the tomatoes that seems to make the difference. YUM! Sounds delish!!! I like the roasted garlic tomato idea! wow. 100 in the month?!!!!!! thats only 20 per week! and then you have kids, diapers…..That will be amazing. we’re working on our budget of 300 a month and its just the two of us. but we also live in CA where its really expensive and its hard to stretch a buck…. I have decided to give this a try too! I work outside the home full time, so easy breakfast and dinner recipes are a must for me. I noticed under breakfasts you have listed sausage muffins. My Food Lion had rolls of Jimmy Dean sausage marked down to $1.40, so I bought a few and stashed them in the freezer. Would you post the recipe or point me in the right direction for them? Sounds like they would make a great “portable” breakfast for my family. Most days we are eating breakfast quite literally on the go – in the car during our 1 hour commute. Thanks so much for what you do…Happy New Year. I look forward to following along and posting about our progress! Here is a recipe I shared on Mary Hunt’s Everyday Cheapskate column! Great goals and love your menu. As for your pinto beans, we grew up on Soup Beans and Cornbread with chow chow, but that’s an Appalachian thing. We live in Georgia now and not too many folks around here eat that sort of thing. I use pinto beans to make Mexican Chili Beans for chili, nachos, tacos, rice & beans, and anything requiring a can of “mexican chili beans”. Enjoy and hope you have success with the challenge this month. We’re trying to do it too! This recipe is pretty similar to what has been posted in the comments already, but I take a 2-3 lb roast, carrots, potatoes, onions, celery, a packet of french onion soup mix, and a quart of canned tomatoes and throw it in the crockpot for 6-8 hours on low. We eat the roast and vegetables for dinner that night and the next day, I cut up the leftover meat into bite size pieces (the vegetables too if necessary), add some beef stock or broth (you could certainly use buillion and water) and barley and TA-DAAAAA! Vegetable Beef Barley Soup for the next night’s dinner! We always have leftovers of the soup for at least a few days. Talk about frugal! If you get the roast on Manager’s Special, you can eat for days on $5! I shop Tractor Supply and love to pick up there free magazine “Out There”. I read the $5 Dinners article that features you and found it very informative. I too am trying to cut costs with my grocery bill. I will be using your ideas for my next grocery shopping trip. I also blog for our Web site and my sub title is “A little bit of this and a little bit of that.” I share some of my life events, tips and ideas. I love getting and giving tips and ideas. I am also the Web manager for our local newspaper Web site. We are interested in adding a link from our bloggers page on our Web site to your 5dollardinners.com blog. Would you be interested in allowing us to do that? You can check us out by logging onto http://www.hampshirereview.com and clicking on our Bloggers page. We have 12,000 uniquie visitors per month. You are welcome to include a link on your page Ann! Tye the Pioneer Woman’s Pinto Bean recipie…easy and delicious! We are doing the eat from the pantry challenge as well. We are not shopping at all for the month–including for diapers. In the past, we have had to eat from our pantry for over a year (including tolietries, cleaning supplies, and diapers for 3 children) and we still had enough to eat. My husband’s income varies, and nothing is certain until he has a check in his hand. I knew we would have to stay home from the stores completely in January, and now it looks pretty certain that we will have to in February as well, and possibly longer. We’ll be having pot roast as well this month! We have 200 pounds of potatoes in our pantry, so we’ll be having lots of meals with potatoes this month! You go girl!!! That’s a LOT of potatoes!!! Pinto beans are one of my favorites. I make them into refried beans — soak and then cook them with the spices. Then I puree them adding salt and tasting the other flavors. Finally, I warm them back up in a little olive oil. I have a basic recipe, if you are interested. Healthy, frugal, and very, very yummy! I also enjoyed this pinto bean recipe: http://southernfood.about.com/od/pintobeans/r/bl84c4.htm. I am sure I added more garlic since it mellows as it cooks. I have both of these in my freezer right now. Thanks Angela! Send over your recipe! wow, a whole month of planning impresses me. i’ll have to tell my sister, who is also taking the challenge. I recently came across your website, and you have some fantastic ideas!! You have really inspired me to try to cut back on our grocery budget. For just my husband and I, we usually spend about $350/month on groceries. I can never seem to find many good deals here in Canada, that you do in the US. I try to purchase a lot of an item that is on sale, but around here $3.44/lb for chicken is a great deal…so it makes it difficult to only spend $5 for dinner. Do you shop at several different grocery stores, or just shop the same store every week? Welcome Ashley! I generally shop at one store…but I might stop into another store if I know they have a better deal and I’m in the area!